Crack seed is a Hawaii snack item with a taste that is, well, acquired. Generally speaking, it is a Chinese food item, imported with Chinese sugar plantation workers who arrived in Hawaii in the mid-1800s. Crack seed is essentially bite-sized preserved fruits, plums being most common. There is almost no end to the varieties of crack seed available to Hawaii consumers. And while prepackaged varieties of crack seed are available everywhere from the local 7-11 store to whole sections of Longs Drugs, there remains a handful of crack seed stores that cater exclusively to the particular tastes of Hawaii residents young and old. Salty, sweet, or sour, or any combination of those flavor profiles are what set crack seed apart from mainstream snacks like pretzels, say, or pistachio nuts. Chief among these flavors and certainly the most popular is Li Hing, which is a powdered mix of dried plum peels, salt, sugar, licorice (and sometimes – eep! – aspartame). The Li Hing flavor, some may say, has been culturally appropriated into margarita and martini recipes. Chefs experiment with the flavor, perhaps glazing a duck in a Li Hing reduction or incorporating it into a vinaigrette for a snobby salad. These erudite applications aside, for many in Hawaii (and particularly for Hawaii residents away from home) Li Hing and any and all varieties of crack seed are truly a comfort food. 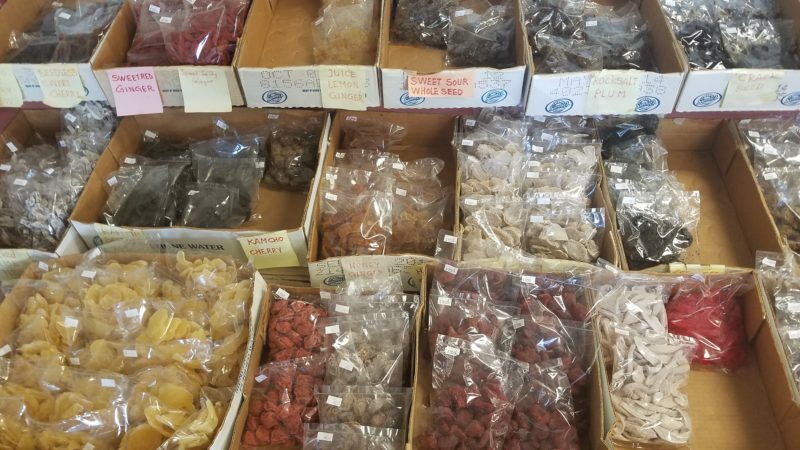 It is safe to say that any care package from Hawaii will include some crack seed along with staples like laulau, mochi crunch and dried cuttlefish. I’m speaking from experience when I say that crack seed is a comfort food for us here. This is because of the memories we associate with trips to the crack seed store. 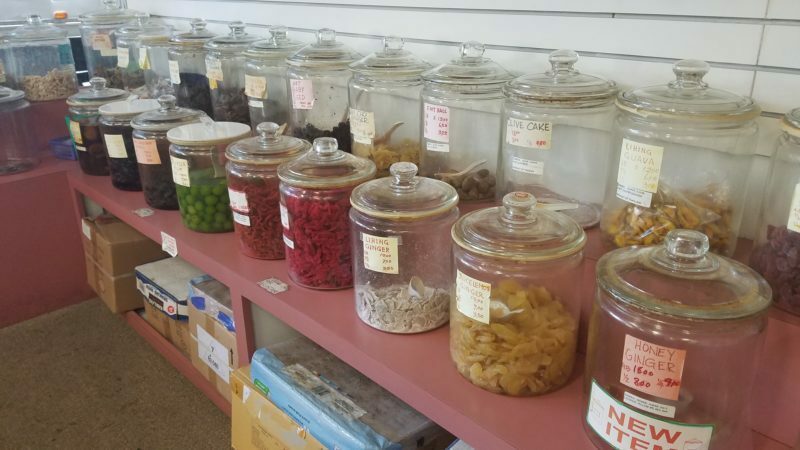 To a Hawaii youngster raised on crack seed, those 5-gallon glass jars at the local crack seed store were not full of food, but of treasure. The smell was and is sweetly divine. We old-ish residents all remember now-defunct Yick Lung crack seed brand products. It was founded in Hawaii by Chinese immigrant Yee Sheong in the early 1900s. Among the flower lei that draped high school graduates in the 70s and 80s there was always a string of Yick Lung treats. More crack seed selections at C-Mui Center in Chinatown. I’ve tried to share the joy of crack seed with the kids of my mainland haole friends and family. I’ve failed almost categorically to no avail. “It looks like a salted turd!” I get that they don’t get it. It’s uniquely Hawaii to understand the simple pleasure of savoring a meaty Rock Salt Plum. Or nibbling at a flattened bit of salty-sweet dried and preserved lemon peel. You have to know to know.